With the weather being so nice I have been focusing on the outside of our home. 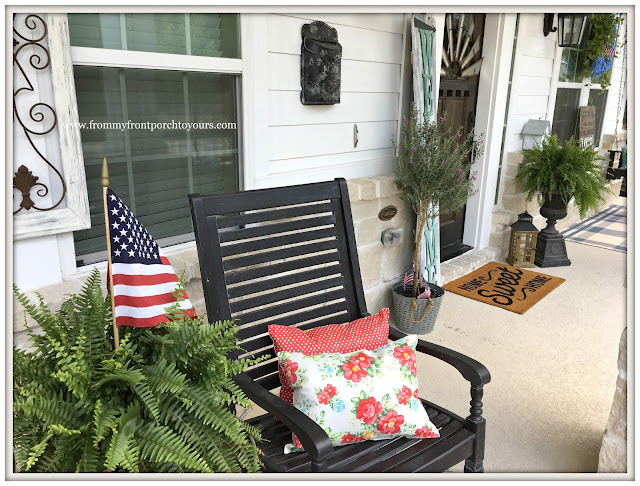 I was wanting to change up the front porch some more with fresh pillows. The cost of pillows is crazy expensive at least the ones I want. LOL. Mr. Front Porch and I were walking thru Walmart . I always like to browse The Pioneer Woman collection. 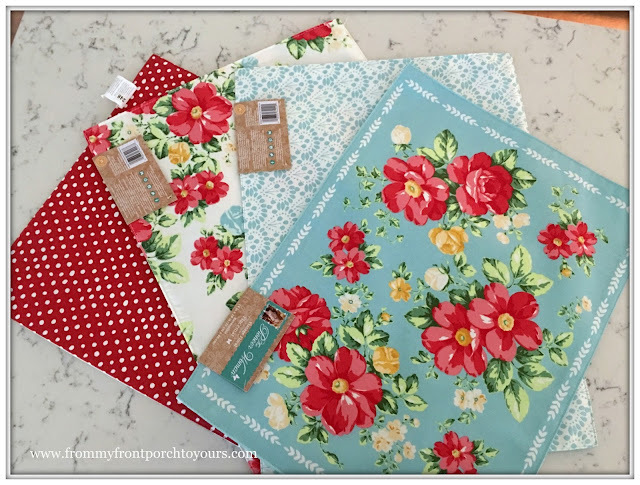 I spied these placemats which I love. 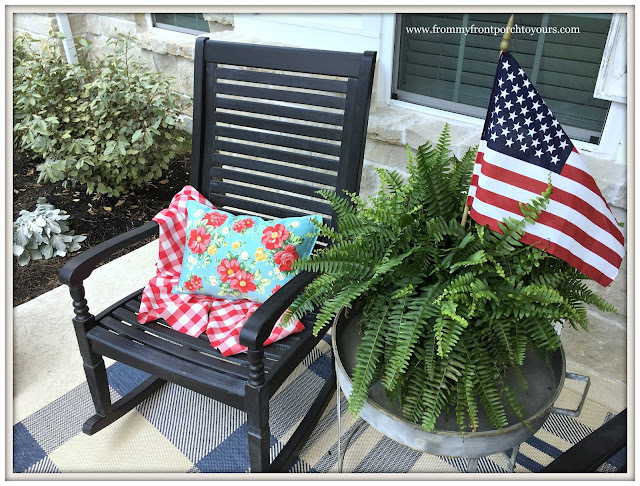 I thought how fun they would be to work into a patriotic porch or even just a fun summer porch. They are double sided so twice the fun. The placemats were less than $3.50 each. I purchased 6. Along with the placemats I purchased a large bag of poly-fil. It was around $8. 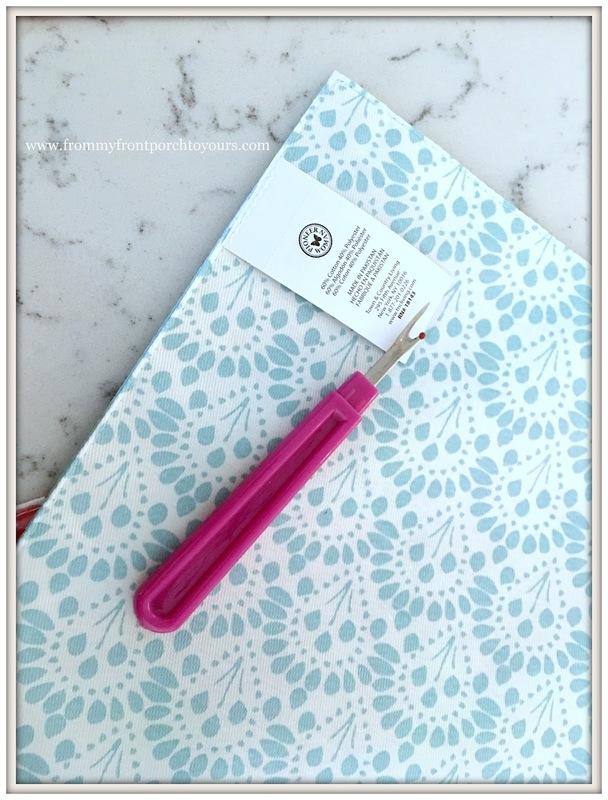 I used my seam ripper and made an opening in the placemats large enough for my hand to fit in. I chose to do this where the contents tag was sewn on since I was needing to take it off. After that I just got to stuffing. 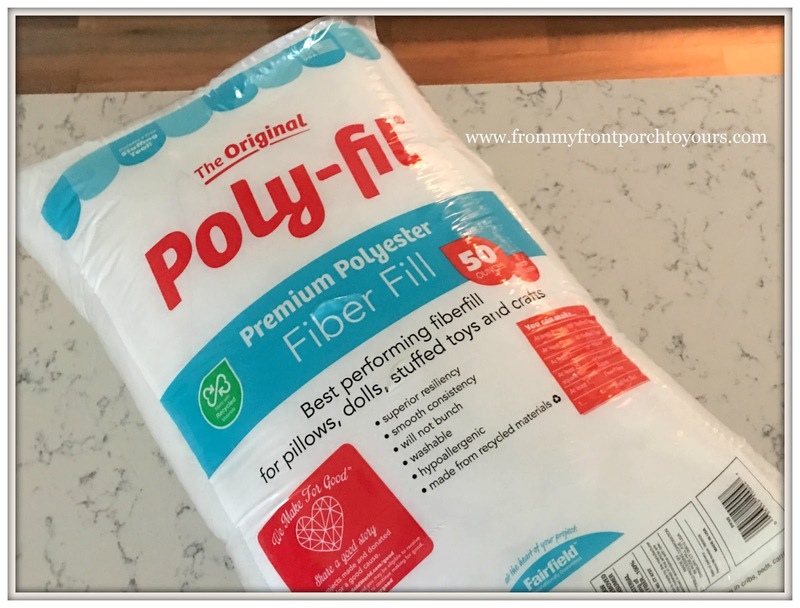 The one bag of poly-fil was enough to fill six pillows. Some I overfilled and had to readjust but it all worked out. 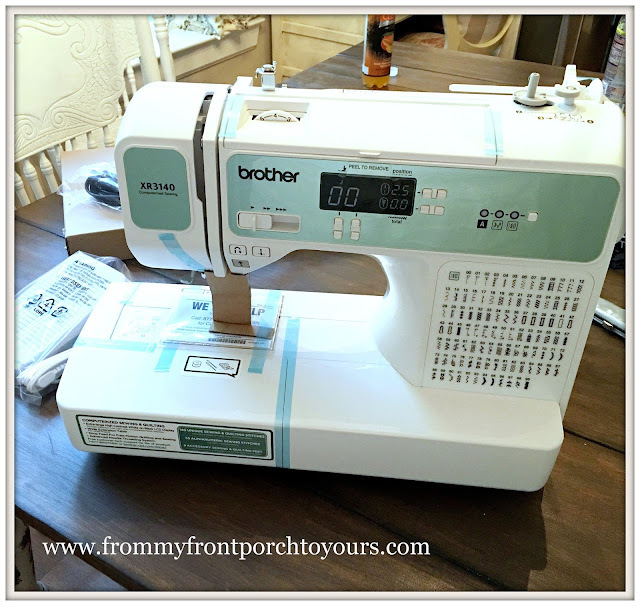 Next up I busted out my new sewing machine that I got for Christmas back in 2015. With all the crazy moving stuff last year I never had a chance to get it out and play with it. This model is a little different from my last model and since I had not sewn in over a year and half it was like learning all over again but I figured it! 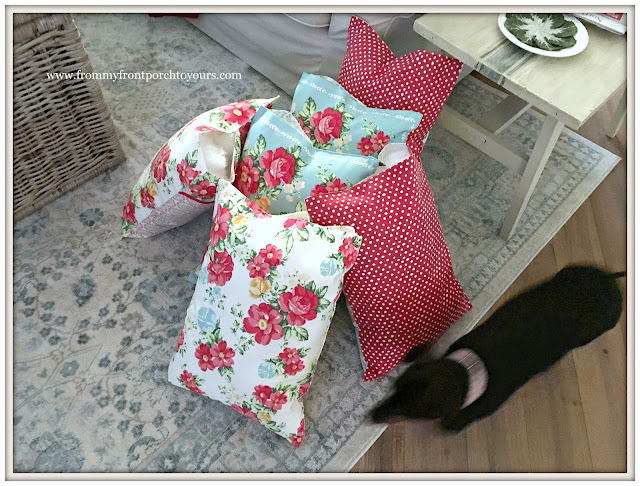 Now I have plenty of pillows for the porch and they did not break the bank. I hope that everyone is having great week! very clever idea! I love that floral print! Thanks Angelina! The floral is what called to me as well. You didn't say how much the placemats were, but I bet they were way cheaper than other pillows. I was at PotteryBarn today and they have similar floral pillows for over $40 each without the pillow...that's just for the cover. You win the prize this week for best pillow inventiveness. Thanks Sugar. They were around $3.50 each so veery economical. Absolutely love these pillows. The patterns are so cute! Thank you Stacey! Can not wait to see house updates this week. That is incredibly savvy to recognize that you could open those placemats up! I'm so impressed! Your new pillows are just gorgeous! Pamela, what cute pillows and such a clever idea! Happy Wednesday! Thank you Pam and I hope your weekend was a good one! Thanks Courtney! It is a hit or miss on quality as far as the cookware/dinnerware goes but I still can not resist looking and buying a few pieces that are hits. Thank you GiGi. The swing I purchased from Grandinroad last year. What pretty patterns on the pillows! They turned out awesome. Good for you, thinking bit more to see potential in placemats. Your pillows are so pretty, love floral fabric mats, make perfect pillows at way less than premade. Napkins are good sources also, usually good size for pillow forms. I used to cruise Pier One in several places we lived for napkins/placemats during their sales. Usually found napkins/mats for much less than buying fabric, win,win. I have fairly new Brothers sewing machine have hardly used. Shortly after I bought it had right should replaced then physical therapy for months so didn't get to work with it long enuf to remember how it works. Need to clear out sewing room to use it/get to it, lol. Mine isn't as fancy as yours but didn't want lots of stitches, just wanted fairly basic machine. Have an old machine from Sears hubs bought me shortly after we married (over 48 yrs. ago) which still works. That machine has seen some sewing and been drug all over country, couldn't get rid of it. I need to get sewing room organized, cleared out as been wanting to sew for while. Am lucky to have room, altho quite small, to jump in for mending or to start project. Enjoy your wonderful new pillows and rest of week. From photo pillows make porch quite cheerful. I love the Brother I have not for all the stitches but because it is electronic. I can not figure out how to use one where I can not just punch in the settings. I need to get my sewing room organized as well. Right now it is the catch all for my home decor I have not unboxed yet or found a place for up in the attic above the garage. What a great idea! I may have to do this too... love the prints. Thanks Brooke. Hope you had a great weekend. You did a wonderful job, the pillows look beautiful on the porch. TFS. That is a clever idea and I how the pillows turned out! 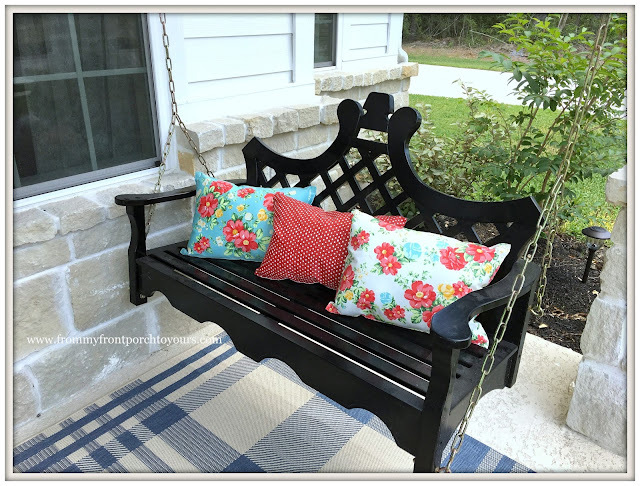 Your porch looks adorable! Oh girl, you have just opened up a whole new world for me. I have thought of using napkins and maybe even placemats but never thought of opening them up. This is genius! Thanks for sharing and glad to see you enjoying your new sewing machine too! Those are so pretty, Pamela! I have yet to check out The Pioneer Woman's collection...sad but true! Love this idea! Those fabrics are gorgeous! Thanks for sharing. I'll be making these.